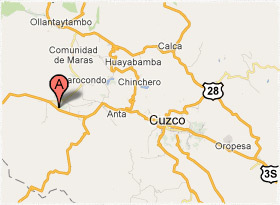 The project is located West of Anta and just outside of Izcuchaca. Getting to and from Cusco is relatively easy, with public transportation options that will stop just up the road from the entrance to the property. The trip takes about an hour on public transportation - bus from Cusco to Anta and then transfer to a van that will take you the rest of the way. If you are in a car the trip takes about 40 minutes. Click here for the location on Google Maps.